No more waiting! 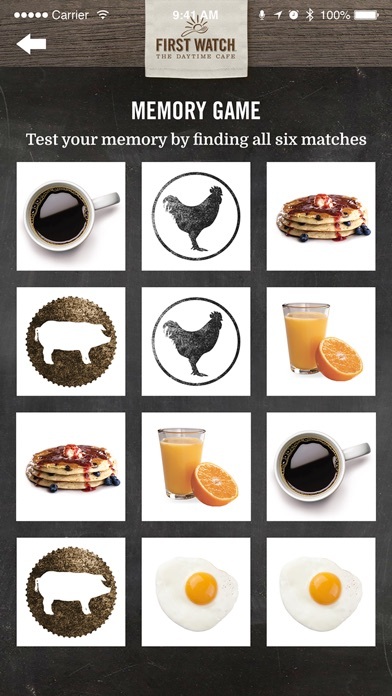 The First Watch App is a convenient and easy-to-use app that allows you to put your name in for a table from anywhere! 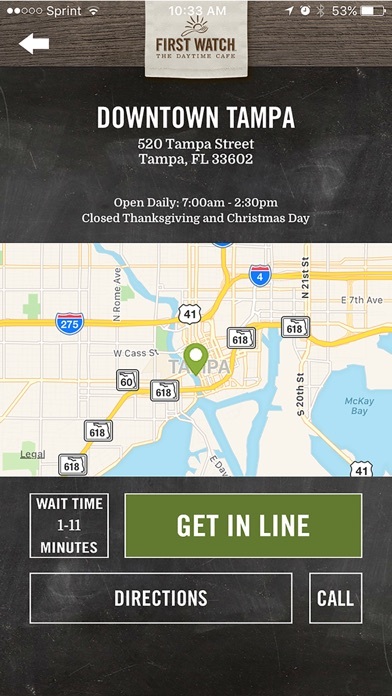 See how long the wait is at your local First Watch, add yourself to list, then time your visit accordingly. 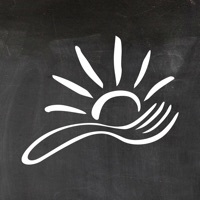 The First Watch App also allows you to see the menu, find your restaurant, play a fun memory game and sign up for the Sun eClub. More exciting benefits will be added in the future! Won’t let me get in line. Useless. Signed in to “Get in Line” and received confirmation text. Arrived 15 mins later to check in and didn’t exist on their list. Luckily she saw the text, confirmed I was at the right location and moved me up by hand. Tech fails again! Just because you use this app and sign in, does not mean we didn’t have to wait. Our wait time was 15 minutes. I walked in at 15 minutes and they told me I had another 20 minute wait because there were people that signed in before me. I showed him the app and he laughed and said, you still have to wait. According to the app, there was no one ahead of me. Might be a good app, but doesn’t support getting in line with parties bigger than 6. An 8 person group is out of luck. Considering this is the main reason I downloaded the app, it’s a fail. Says “we can seat you” when started up. Only works when you arrive and join a long line. Has only worked 1 or 2 times. Just like everyone stated, totally not functioning correctly. Won’t let me join line or leave a line. Then I called and they said they are not supposed to take your name over the phone. Well, if your app doesn’t work then help me out please! So frustrating! I downloaded the app and was excited to see that I could get into line before I get to the restaurant. I did, and they texted me a confirmation and our spot in the line. But less than five minutes afterward, the link stopped working and the app said that I wasn’t in a line. I called the restaurant to confirm I was in line, and they told me I had opted out. They were really kind and reactivated my reservation, but I am really disappointed that the app didn’t work. However, I wish there was a way to place a to go order from the app so when I call the nearest location, I have an option to the busy signal. When this app works, it’s fantastic. When it doesn’t, all I get is a picture of food and it freezes. Unfortunately, it doesn’t work more than it does. I’ve only been able to use it to get in like twice over the last year or so. I reinstall etc etc and it still won’t open and work. App needs to be fixed for Apple users. Please update it and fix it!! Won’t let me change to a different location. Used this app in March when I was visiting Tucson but had selected the wrong location so when we arrived we weren’t on the list. Trying to get in line at the correct one this time and it won’t search for locations near me. Gah! I called to get quoted wait times and they wouldn’t give me the wait times over the phone and referred me to the app to check. So, I downloaded the app and checked and it said the wait times was zero. When I arrived the wait time was 20 mins. I showed the hostess that the wait time was still saying zero when we arrived and she said “sometimes it doesn’t link”. What is the point in telling me to download the app? My First Watch near me doesn’t even use the app so when I went in expecting a 0 minute wait it ended up being 30. More of a 0 star rating for the management at the First Watch at Villanova. I’ll be brief. This app is garbage. It kicks you out, it doesn’t refresh, the ONLY thing it does kind of ok is load the menu but even that is not reliable. There is no reason to download this app and take up room. When we got in line, the app said we had 15+ people in front of us and an hour to wait. We timed our departure from home according to that. In 20 minutes we had 12 tables ahead of us and were told to arrive in 30 minutes. I checked two minutes later and it said our table was ready. Naturally, we were unable to make the 5 minute drive to the restaurant in that time. This has happened to us several times. The last time I ate at FirstWatch, The staff excitedly told us about the First Watch app and the ability to “get in line” online. I put the app on my phone and used it today to get in line. 15 minutes later when we arrived at the restaurant, we were not on the list. When I went to the text I had received confirming that we were on the list, it showed our place in line. We confirmed that it was the correct location, yet the restaurant could not see my name on the list! Great food, but I certainly will not depend on this app to do what it is supposed to do. 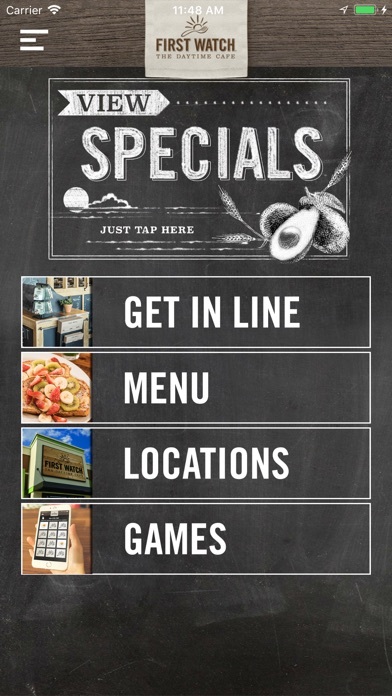 I only got this app because the website says this is where to make reservations. Once on the app it tells you to call. Mad I waisted my time on this. This app never works!!! We even called the restaurant to make a reservation. The person we talked to on the phone didn’t even bother to write our name down. What a waste of time!!!! Called ahead to my local restaurant to get in line for a table; having a party of nine and needing a sling and a high chair. They told me they couldn’t help, and I could only do that with the app. Downloaded the app while my wife drove us there- and put our name in using the app. The app only allows up to 6, and had nowhere to list the need for a high chair or a sling, so I had to call back anyway to tell them. The opposite of convenient or easy, definitely for the benefit of the restaurant not for the customer. I hate this app. It doesn’t work. One you get in a line, you cannot leave the line. I’m unable to change to a new location. The location at my house showed as “we can seat you right now” and wouldn’t let me check in. Then when I showed up there was a wait. You check in line with the app, then get kicked out by the time you get to the restaurant. Honestly don’t know why this app even exists. Called ahead for a party of 6 and they told me to download the app to reserve a spot in line. The app said we had 0 people in front of us when I arrived and when I checked in with the hostess suddenly the wait was up to 30minutes. Disappointing to say the least. I checked the app many times this morning. I was meeting fried for breakfast (it’s Sunday) at 9:30 so I figured I’d get “in line” through the app. Checked from 7:30-9:30 and the app said there no wait at any time. It didn’t seem correct, but there was no option to put my name on the list bc there was allegedly no line. Got to the location at 9:30 and was told the wait would be 45 minutes to an hour - and that “technology can be glitchy.” No apology, just shirted shoulders. We went to another restaurant instead. Don’t promote an app that doesn’t work. Very disappointed. Used to go to First Watch weekly, but we were blown off today so rudely, I don’t know when/if we’ll be back. Used the Get in Line feature, which is the reason I downloaded the app, but my name did not show at the location. Was not user error, I showed the hostess my app and she apologized and got us a table right away. I got this to find locations when I’m traveling but it does not find locations. When I am on the road I don’t know what the zip code is, this needs to use location to find nearby locations but it doesn’t do that. I tried entering a couple of zip codes but that doesn’t work either. Deleting. The point of the app is to get in line. It kicks you out of line and then you have to wait even longer at the restaurant. Please fix this. Times are highly inaccurate and deceiving. I waited to get our desired time only to be told there were more than 15 parties ahead of us and a 40-80-minute wait! Luckily we were able to grab the community table, otherwise we would have left hungry. Can you add coupons to the ap please? Your emails get lost. I’d like to come to your establishment more often. Put my name on the waiting list, but when I arrived they didn’t have my name on the list. Save your self the headache do not download this is useless. Booted out of line 5 times before we got here. Now waiting for a table as though we don't have the app at all. More frustrating then just coming and waiting like usual. Half the time it says it successfully reserved your place in line but the restaurant has no record of it and you start from scratch anyway, and the other half the time it says it failed but it turns out when you get there that it worked. “Worked” isn’t really accurate, either, because besides the fact you can’t pick an arrival time and are stuck with whatever you happen to be quoted, your wait upon arrival will be EXACTLY THE SAME as if you just checked in in person on arrival. You have saved ZERO time whatsoever. Most bizarre, you can’t check your place in line in this app! You supposedly can do it in Yelp’s app, but why should I have to install an app I don’t want to do something THIS app should do? Gets one star back for letting me browse the menu, but let’s be real: you can do that in a browser on the website, you don’t need this app to do it. This app is nothing more than a mostly useless data vacuum getting your marketing information. “Got in line” via the app, told us the wait was 10min, got to the location 5 min later and we were told our wait was 20min from that point. Clearly there is an issue. This app is super super convenient!!! I was able to add my name to the list and show up at the suggested time and was seated right away!!! Definitely recommend! The “leave the line” line should have a redundancy check to confirm that’s what the user wants to do. I waited for 30 minutes before realizing I had been kicked. Luckily, the local restaurant staff were understanding and sat me right away. It keeps kicking me out every time I try to join the Eclub. Will not pull up any of the locations, but then tells you that you have to have a location to complete process. I’m currently in North Carolina and I’m attempting to use the “get in line” feature on this AP. It doesn’t work. It keeps asking me to locate the closest First Watch...I locate it and it gives me no options. Great food, worthless AP. Can’t do the wait in line on the app and even when the restaurant puts it in for you the text feature doesn’t work. The only use for this app is to “get in line” to avoid the 45 min wait. The app doesn’t update itself so, surprise!, they can’t seat you when you arrive. 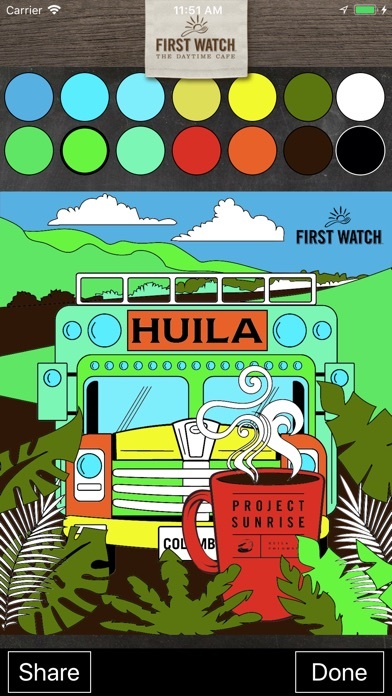 I’ll take FirstWatch off my breakfast list since it’s not worth the frustration. The app reported 15 ahead of us with a recommended arrival time in 45 minutes. Rcvd. a text confirming. When I checked the app 15 minutes later, the number ahead and suggested arrival time had zeroed out, but no text or phone call. We went anyway and the restaurant had no record of us. We were told this happens often. My (large) family and go out to eat every Sunday after church for breakfast. Since we have a pretty large family, there is in average no less than 8 of us going out to breakfast. Last weekend I decided to give the app a try to reserve a place in line, however, the app does not let you reserve for more than 6 people!!! We called the restaurant to place call ahead only to be told that it must be done through the app. We informed them about the issue and they said call ahead must be done through the app! We asked if we should just use the app and reserve for 6 knowing we had 9 people in our party. They said that we could do that but they could not guarantee our call ahead spot!!! So what would be the point of reserving! It really isn’t that hard to have a scroll wheel in an app as many apps have!! This needs to be fixed! 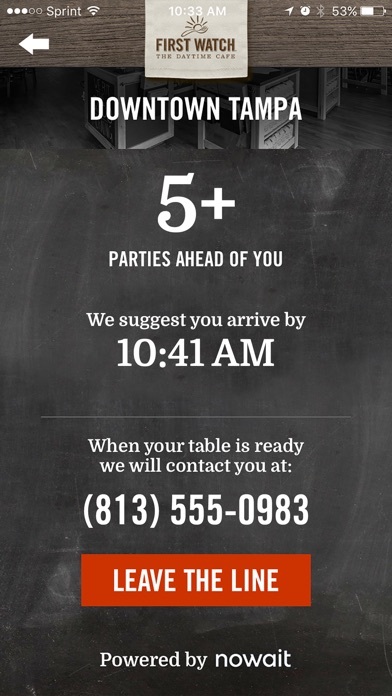 Minus one star for not being able to reserve for more than 6 people and minus one star for not being about to have the restaurant guarantee our call ahead spot knowing their app has this limitation! Edited 5/14: Minus one more star!!! We had a place on line and we were informed that our wait would be 25-35 minutes. After an hour wait, we asked the hostess how much longer to be told that it would be another 25-30 minutes......SERIOUSLY!!!! With three kids in our party two of which are less than two years old how can you tell a customer 25-35 minutes only to make them wait 3x longer. We removed our name from the list and called ahead to another regular restaurant of ours and we were seated and waited on immediately upon arrival. I had used the app to get on the pre-waiting list. The time estimated was 24-42 mins. I had arrived and checked in and 55 mins after using the app, I had another minimum of 30 mins to wait. Needless to say I did not wait any longer. Very poor on timing, and essentially useless for the purpose of getting a “reservation”. Will not ever visit a First Watch based on the unacceptable wait time.